Leaders on each side do not prioritise accounting to their constituents or party members about the reasons for coalitions. Coalitions, or agreements that allowed minority coalitions to govern, formed post the 2016 local government elections are falling apart because some of the political parties involved don’t care much about accounting to the voters, and are more interested in power and positions, according to leading political analysts. Analyst Ralph Mathekga, reacting to the attempted ousting of Democratic Alliance’s (DA) Tshwane mayor Solly Msimanga by a combined force of its own one-time ally, the Economic Freedom Fighters, and the opposition ANC, said the current agreements between parties is all about the whims of the leaders of those parties. “There isn’t much consideration as to how the voters feel about those coalitions. Leaders on each side [EFF and DA] do not prioritise accounting to their constituents or party members about the reasons for coalitions, and what the coalitions would achieve,” Mathekga said. Another analyst, Steven Friedman, said the problem was that those coalitions were not based on agreements on what the city needed, but on a desire for positions. “They are therefore always likely to fail,” he said. While Msimanga survived the motion of no confidence yesterday, his Nelson Mandela counterpart, Athol Trollip was less fortunate earlier in the week. The DA mayor was removed through a similar no-confidence motion, with the UDM’s Mongameli Bobani installed in his place after collaboration among the ANC, EFF, African Independent Congress, UDM and United Front. 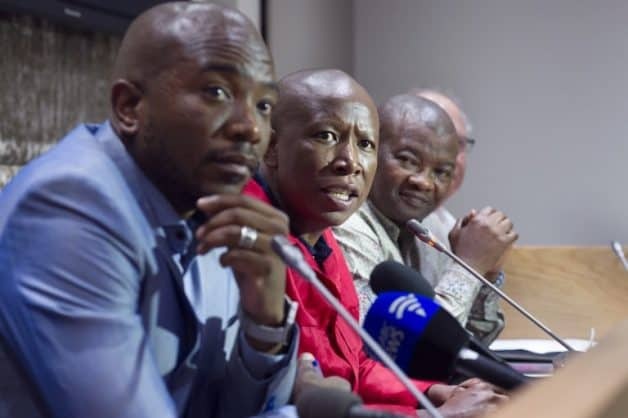 EFF leader Julius Malema this week vowed to ensure that the DA is ousted as a ruling party in Tshwane and Nelson Mandela, a move that drew the ire of DA leader Mmusi Maimane. He defended Msimanga’s record of service delivery and his fight against corruption in Tshwane. Earlier yesterday, ANC head of elections Fikile Mbalula said his party’s cooperation with the EFF was not about power, but about the interests of the people. “The ANC will never compromise on its principles. “We remain open to working with others who want to work with us. But we are not power grabbers – this must be understood,” Mbalula said. He said the ANC’s immediate objective was to bring stability and provide services for the people in the metros, and that was the reason they took a decision to work with other parties. According to Mbalula, the ANC’s approach to coalitions was based on a long-term vision.